Depending on the size of your group, and especially when you're conducting a workshop or longer training, you will want to encourage participation from your audience. There are always some participants who participate more and some who participate less. It's easy for people who are shy to sit back and wait for the more outgoing members to speak up. How do you keep some people from dominating and help others to break out of their shell? 1. 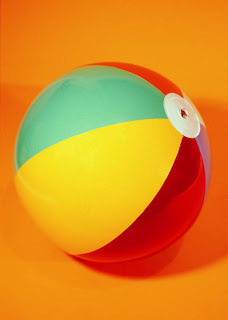 Toss a Koosh ball or beach ball into the group (Koosh is great for small groups, but might be harder to see flying through the air in a larger group). I think it would be really funny to use a balloon for this, because the balloon is hard to direct and hard to catch. I've never tried it, but I can imagine the chaos. 2. Hand out small cards or pieces of paper with words or phrases on them for participants to discuss. I've started meetings with icebreaker-type questions like, "What's the oldest item of clothing you're wearing?" "What did you eat for breakfast, and who prepared it," and "If you found a dollar on the street, what would you buy with it?" For wrapping up at the end, you might hand out cards or pieces of paper with one-word concepts on them (I use "fear," "voice," "passion," "rules" and others related to public speaking), and ask participants to share something they've learned or will pursue regarding that concept. 3. Use an anonymous question box. If your topic is sensitive and you know there are people in the room who are uncomfortable sharing, an anonymous question box is a great way for everyone to be heard. Adults will go to great lengths to avoid embarrassing themselves, so it's important to cultivate trust and a safe environment. Hand out paper and ask everyone to contribute a question to the box. If someone doesn't have a question, they will still write something on the paper (their shoe size, birthdate, favorite color, whatever), so that people who are writing a question aren't singled out. Go through the box at the end of the workshop and answer any questions that weren't covered during the day. Or intersperse the questions throughout the day to incorporate some spontaneity. What are your tricks for encouraging audience participation? As a recovering youth pastor, group participation was key to holding attention. Here are some things I did. 1. If I was trying to get across a percentage reflected in a statistic, I would divide the group up into those percentages and have the smallest group stand. 2. I would find one person that I felt wouldnt be too embarrassed to talk in front of the group. Then I would interview them and ask them questions about the topic. 3. Something else is to present obviously wrong information and keep talking about it until someone challenges me so that the discussion can open up a bit more. 4. A bit off topic. But we would bring actors to "become" someone completely opposite to the groups beliefs or tendencies. It helped us identify areas of animosity or receptiveness. The discussion was so much more lively when they found out the actors were acting. Very stimulating post. Sorry about your email. Great ideas, Tony! Most of my ideas about group participation also come from my work with kids and teens, and work just as well for adults! I love your idea about presenting wrong information. Kids might challenge you about that, but would an adult audience? I wonder! Yeah, the e-mail thing is a HUGE drag. I can usually figure this stuff out pretty quickly, but I'm completely stumped. I might actually have to pay someone to come to my house and mess with my computer. Ugh.